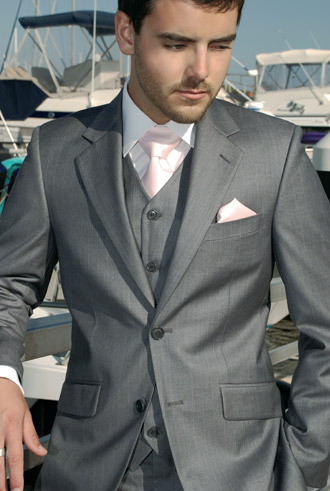 The Groom has had a specific idea in his head about what suit he would like to wear. It had to be a particular shade of grey with pinstripes. We went to our first formal wear store on Saturday. There was just 1 grey suit. He and his 2 brothers tried it on, and picked the vests & ties. 45 minutes later, he’d put a deposit on it. Can it really be this easy?! “Don’t you want to go to several other stores and see different styles (and prices)? !” I said panicky. Apparently it can be this easy for men. I think he might have a look at the factory outlet stores next weekend, but really, it’s done. They decided on the the groomsmen having the same vest colour as the suit, and The Groom with an ivory vest, with the same ivory ties for all. They had ties that matched the bridesmaid’s pale creamy pink dresses, but I just can’t put the guys in any kind of pink (disclaimer: this is just my opinion). I wonder if this is too plain. Should we jazz it up with funky ties? I’m not sure. Thoughts? Glad you got the suits sorted so easily! 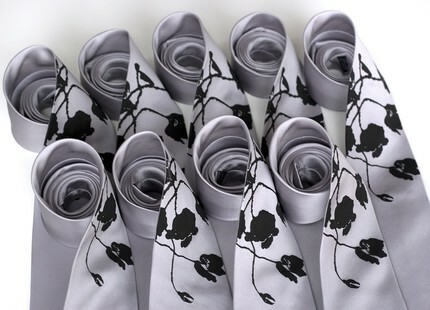 With the ties, I’d say it depends on the style of your wedding (and what the boys think of course). 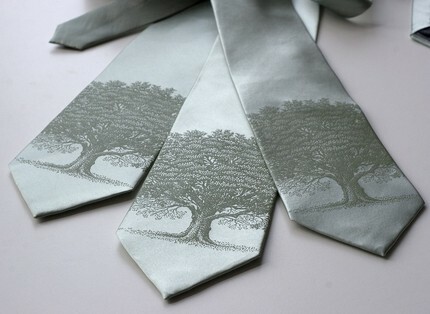 If you’re having a formal wedding then the ivory ties will work a treat. If you don’t mind a bit less formality though, I say go the funky ties! I think also with funky ties that the guys will probably wear them again rather than just stuff them away in a closet somewhere after the wedding. Good points! It’s not a very formal wedding, so we could do either – they’d be hiring the ivory ties though, not purchasing. I like the flower tie! Thanks Noddy! I think the flower ties are quite nice.